While your bird has about 2 hours left to cook, spoon out ¼ cup of pan drippings from the bottom of the pan. Aim for the juices from the bottom rather than the fat floating at the top. Add the pan drippings, the seasonings and the rice in a large casserole dish. Stir so that each rice grain is coated. Add water according to package directions. For example, for 2 cups of rice often the package calls for 4-6 cups of water depending on the type of rice. Place a lid or aluminum foil on the casserole dish and place in an oven that is anywhere between 325°F -350°F. Check the rice after 45 minutes. 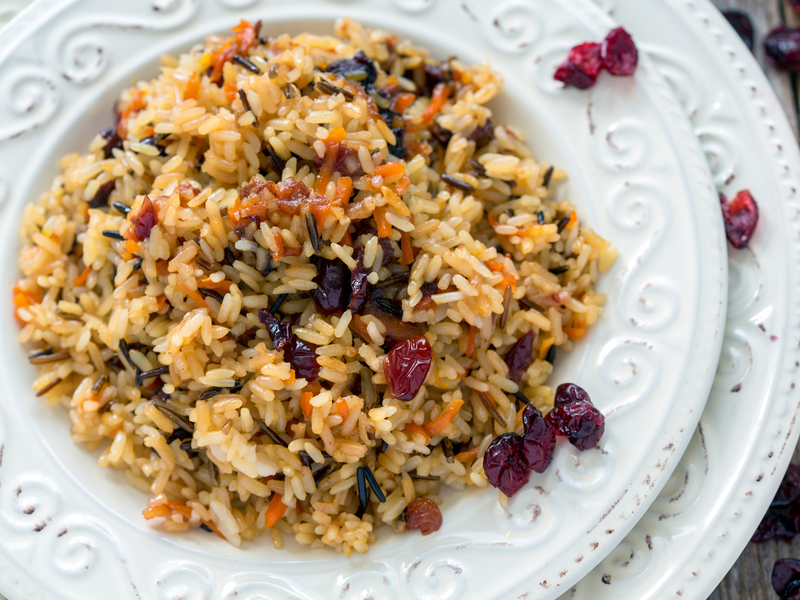 If the rice is tender, remove the lid and let cook for another 20-30 minutes or until the liquid is absorbed. The safest and easiest way to prepare stuffing is to cook it separately from the turkey because the cavity of the turkey does not get hot enough to kill the bacteria around the stuffing. This stuffing cooked with pan drippings has so much flavour; it is THE side dish alongside wild birds or turkey.